Ron Stobaus: co-founder and life member. Ron Stobaus is, of course, a life member, but for a number of reasons he deserves his own page! On 16 October 2015, Keilor St Bernard’s Athletic Club bestowed on Ron Stobaus a fifty-year service award. A 1950s athlete in the 1950s, Ron was a co-founding member of St Bernard’s Old Collegians Athletic Club 18 months before its official registration with the Victorian Amateur Athletic Association in 1965. Ron was instrumental in the establishment of the Keilor Little Athletics centre in the late 1960s. In the next decade he also assisted in establishing the Keilor Heights women’s athletic club which initially trained at St Bernard’s. The two clubs merged in the 1980s when the Victorian Women’s Athletics Association and the Victorian Athletics Association merged in 1982. Ron was made a life member of Keilor St-Bernard’s in that year. Meanwhile, Ron had helped set up a combine team, Striders, to allow club athletes to compete at A grade Level, drawing athletes from St Bernard’s, North Old Boys and Old Paradians. Following retirement, Ron continued his lifelong work of promoting athletics via his work with schools coaching, and of course, continuing to provide advice, inspiration and practical ideas to everyone at Keilor St Bernard’s. 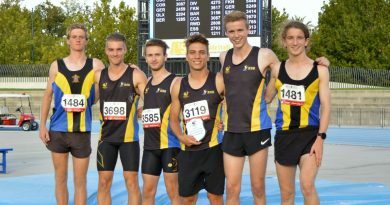 Ron chaired the Athletics Victoria (then VAA) coaching committee, was a member of the Victorian junior development committee for 20 years and ran the annual week-long Falls Creek distance camps for the distance group for six years. He also managed Victorian schools cross country teams to championships in Perth, Sydney, Hobart and Melbourne. Ron attended the 2000 Sydney Olympics and 2006 Melbourne Commonwealth Games as a volunteer, assisting athletes at their training venues. Ron was named Athletics Victoria’s coach of the year in 2004. Ron has served on the club’s committee through its entire history, holding positions of president, secretary, treasurer and head coach. Four world, eight Australian and twelve Victorian masters’ records.